I lived in Ballarat till I was 5 then I moved to Thailand and lived there for 5 years. In that time I learnt a lot about how poor people live and way I might be able to help them. So we hadn’t been to Australia once for that 5 years and I had forgotten completely what is was like and we went back for 1 year. Then we moved to Poipet in Cambodia (the main border town to go to Thailand) and it was the worst place I have lived yet. It had about 90 000 people in it and the closest thing they had to a shopping centre was a small mini mart and some markets. Next we moved here to Phnom Penh and have been here nearly a year, that is where I have lived my life. There are 6 – 8 families living down the road, in a slum… One of our neighbours owns at least a million dollars worth of cars, but they aren’t helping. I’m not that great with persuasive writing so I’ll just tell you the plain simple truth in this. All of these families live in small things you can’t even call a shelter, or hut, or home, or anything really, they just look like a large pile of rubbish. They are mainly made of cardboard and old cloth found in the trash. The luckiest of them all has a large umbrella to put over their shelter; the next lucky ones have large old sheets. It is also wet season and the rain is coming down long and hard, and all these people live on a terrible dirt road, so the ground they sleep on has turned into mud. So now you have 6 – 8 families, not just single people, but whole families, man wife and young children, all sleeping on wet muddy and ground under a roof that doesn’t hold the water back so they end up wet, cold and muddy. They also don’t have any money, they walk around the dirty dusty streets all day in the searing heat covered in sweat, their bodies speckled in mud picking up bottles, cans and cardboard from the streets to bring to recycling places to get a bit of money. They also send their children out in different directions so they can scour as much of the city as they can to get as much money as they can. Then they come home to their old rickety shelter with no food or clean water. So I decided that I wanted to do something! 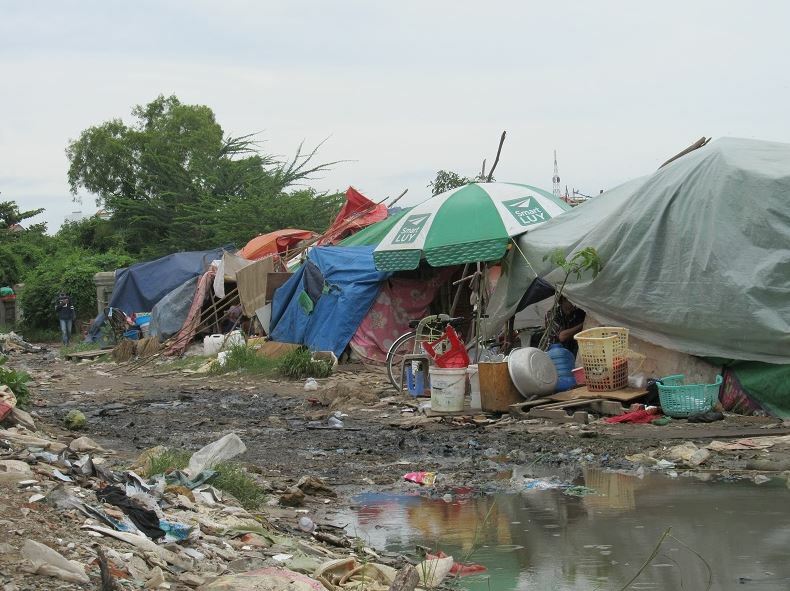 I don’t want to live about 80 meters from a small slum and not do anything about it! So I have been thinking about it for the last four months but I could never think of how to get the money I would need to do it, so when it was suggested that DECV could help to raise money I thought that it was a great idea! I need your support to help these people, if I can get the money that I and the slum people desperately need I could help so much and make these people so much happier! This is a non-detailed version of what my plan would be. The project I want to do for the people down in the slum is simple enough so far. Once I raise the money I need to start I will be doing the simple things in the beginning, I will first buy large 20 litre bottles of water for a dollar each and then buy a $50 water filter or two that will make water from hoses and taps healthy and drinkable so they can have enough water to live off. Then I will make sure to provide all of the families there with enough food to stay alive and well and try to think of something I could do to get them sustainable jobs so they can support themselves. I would also build (with the help of a few other people) small wooden platforms to keep people out of the mud and give them tarp or other types of plastic or corrugated iron roofs. This is my long term goal that can only happen with heaps of support and funds. If I end up with amazing feedback you and get more money than I thought I would be getting then I will know that lots of people really want to help these people. I’ll make a website supporting these people so people can donate there as well. If I get amazing feedback from the website and everything ends up going really well I will be able to rent a small block of land just down the road and make a small Khmer (Cambodian) restaurant with simple cheap meals (which many Khmers want, simple and especially cheap). The money earned with the restaurant will support the people from the slums as they will be the staff for it and when I move away I will know that I have done all I needed to do there. I know some of you reading this must think be thinking “Pffft, how could a kid do that all by himself” and it would be difficult but possible for me to do by myself, but I’m not. I already have at least 5 people ready to come and help me out as soon as I am ready. So it is all up to you now, all of you get to make a decision, will you help? Anyone who is interested in supporting Levi in his project is encouraged to forward their contact detail to Sam Ellis sellis@distance.vic.edu.au, who will notify you when Levi’s project webpage is up and running.